The American Health Care Act passed in the House by a slim margin and is now under discussion in the Senate. Plain and simple, this bill undermines Medicare’s financing and risks access to essential care for people with Medicare and Medicaid. The American Health Care Act repeals the Affordable Care Act’s modest tax on the highest earners, which helped put Medicare on stronger financial footing. Eliminating this tax would lead to lost revenues, causing the Medicare Hospital Insurance (Part A) Trust Fund to become insolvent two years earlier than anticipated. The American Health Care Act also advances devastating Medicaid cuts—per-capita caps—that threaten access to needed care for the 11 million people with Medicare who also depend on Medicaid. One in five people with Medicare rely on Medicaid to cover vital long-term home care and nursing home services, to help afford their Medicare premiums and cost-sharing, and more. Write to your Senators and tell them to reject the American Health Care Act, and any proposals like it, and to engage in a transparent, bipartisan dialogue on needed reforms to enhance health care access and affordability. Tell Congress: Simplify Medicare Part B enrollment to avoid costly mistakes—co-sponsor the BENES Act! Enrolling in Medicare Part B can be complicated. The 10,000 people aging into Medicare each day are asking questions like these: Should I enroll in Medicare if I’m still working? What if my spouse is still working? Can I wait to enroll when I start Social Security benefits at age 66 or 70? Getting these answers wrong can lead to costly mistakes and gaps in health coverage among many people new to Medicare. Congress needs to act now to simplify Part B enrollment and make sure every American gets accurate information about how and when to enroll in Medicare. A bipartisan bill introduced in Congress—the Beneficiary Enrollment Notification and Eligibility Simplification (BENES) Act—would improve the Part B enrollment process. Through better notice, updated enrollment periods, and more, the BENES Act modernizes enrollment rules written when Medicare was first created more than 50 years ago. More than 70 organizations representing older adults, people with disabilities, insurers, and health care providers support the BENES Act. Urge your members of Congress to co-sponsor the BENES Act and improve the Part B enrollment process for the 10,000 people aging into Medicare each day. People receiving Social Security benefits are automatically enrolled in Part B, but today many Americans are working longer, delaying retirement, and deferring those benefits. These individuals must actively enroll in Medicare, taking into account varied and complicated rules. Those who mistakenly delay Part B can face a lifetime of higher premiums and may go without needed care. We need your help to pass the BENES Act! In 2014, 750,000 people with Medicare were paying a lifetime late enrollment penalty because they waited too long to sign up for Part B. The average penalty amounted to a nearly 30 percent increase in a person’s monthly Part B premium. Far too many people with Medicare are saddled with higher health care costs and gaps in coverage due to a fragmented Part B enrollment system. Take action today! Tell your member of Congress to co-sponsor the BENES Act. Older adults, people with disabilities, and their families and caregivers need assistance understanding the A, B, C and Ds of Medicare. Operating in every state, State Health Insurance Assistance Programs (SHIPs) answer questions about Medicare and help people solve problems. Tell your members of Congress to protect SHIPs from an unprecedented cut. Eliminating SHIPs would leave millions who need support comparing coverage options, appealing denials, applying for financial assistance, and navigating increasingly complex Medicare benefits stranded—with nowhere to turn. As 10,000 Baby Boomers age into Medicare each day, rather than defund SHIPs, Congress needs to increase SHIP funding. Write to your elected officials about why investing in unbiased, personalized Medicare counseling is important to you and your community. Every year, the Medicare Rights Center helps thousands of individuals navigate the complicated Medicare Part D appeals process. Because the process is the equivalent of a nonsensical maze, it leaves beneficiaries confused, frustrated, and unable to adhere to prescribed treatment plans. 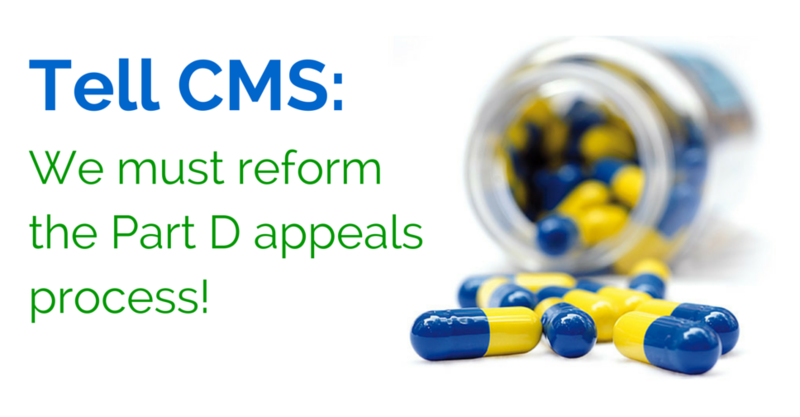 Join the Medicare Rights Center in calling on the Center for Medicare and Medicaid Services (CMS) to immediately implement reforms to help people with Medicare better navigate Part D denials and appeals.